A dictionary containing more than 20,000 words related to several fields of law and related areas. A resource bank containing sample contracts and other documents organised around practice areas. Get to know the latest tips and tricks to master your knowledge of legal English. Free Legal English e-book on 'Contracts and parties'. Download it here! Anglofon Studio was established by András Petz in 1996 as a translation agency. The company quickly gained recognition for the quality of its services in numerous sectors, especially among legal firms and corporate lawyers. In 2000, Anglofon Studio’s business activity was extended to teaching Legal English. In recent years, Anglofon Studio has become a market leader in this field in Europe. We develop Legal English teaching materials, both in printed and electronic format, and teach English for special purposes. Our services have always been tailored to the specific needs of our clients and the company's growth has been driven by the rising demand for its services. After a brief summary of civil procedure, this book gives a structured overview of the specific terminology of civil law. The contents are primarily based on continental jurisprudence. 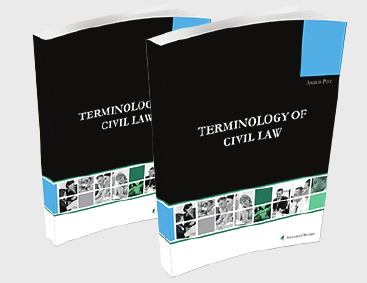 It applies a hitherto unprecedented methodology to give an insight into how the terminology of civil law compares with that of common law, all clearly explained in English.